Deleting an XDCR replication stops the replication of data, and removes the defined replication from Couchbase Server. The examples in the subsections below show how to delete a replication; using the UI, the CLI, and the REST API respectively. As their starting-point, the examples assume the scenario that concluded the page Resume a Replication. This features information on a single, currently defined replication. In the status column, this replication is shown to be Replicating. The replication has now been deleted. From the starting-point defined above, in Examples on This Page, use the xdcr-replicate command to delete an XDCR replication as follows. From the starting-point defined above, in Examples on This Page, use the REST API to delete an XDCR replication as follows. Note the encoded form of the endpoint, which is required. 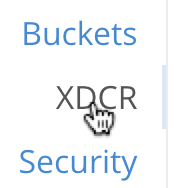 This consists of the id, the name of the source bucket, and the name of the target bucket. These were obtained in Pause an XDCR Replication with the REST API. If successful, no output is displayed. The replication has been deleted. Once a replication has been deleted, you may also wish to delete the reference on which it was based. See Delete a Reference.